As with our other Sapphire models, the highly-rigid frame design mitigates vibration, helping to reduce component wear and increase reliability. Unique through-frame drive belt cooling extends belt life, and an optional pre-filter box simplifies filter cleanout.performance. The 460SS powers through the toughest workday with its 35HP Kohler engine, providing true 2.5-inch dual wand. 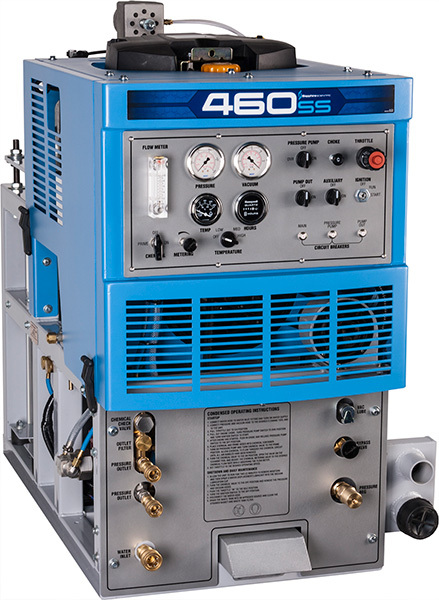 The 460SS's Short-Reach Service Design puts all serviceable parts 10" or less from outer edges, ensuring easy access to components for maintenance. A quick-change heat diverter control allows instant switchover to extraction-only mode and an intuitive control panel simplifies operation. Utilizing a unique patent-pending heat diverter system, Sapphire truckmounts do not bypass or dump water to the waste tank no matter how much time elapses, providing true dumpless operation. This saves water and preserves space in the waste tank, allowing operators to keep cleaning carpets longer.